In this tutorial I am going to integrate jQuery autocomplete plugin into J2EE application having MySql database. Our input field will receive a JSON response via ajax call to the servlet, which will be displayed as a drop down list when a user types, we will achieve this using jQuery autocomplete plugin. Below is a how your project should look after completion. 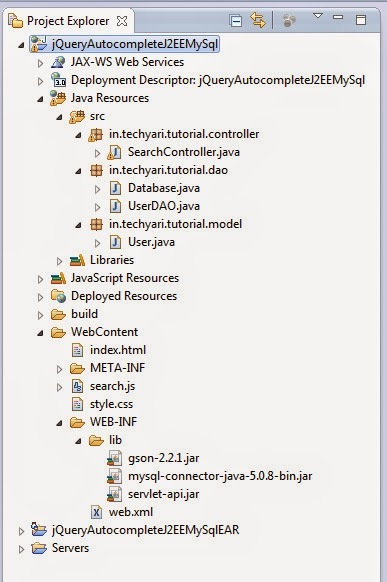 To begin open your Eclipse IDE and create a new Dynamic Web Project ( don't forget to use web module version 3 to support annotations ). In order to move forward launch your favorite tool and create a dummy database with a single table called user with two columns (id,name) and populate the table with some dummy data. &copy; 2014 <a href="http://techyari.in">TechYari</a> All rights reserved. Search.js is being used here to create ajax request to the server/servlet/controller and apply the response to the input box using jQuery autocomplete plugin. When a user types a character in text box ,jQuery will fire an ajax request using autocomplete plugin to the controller, our controller will call the user data access object which in turn creates the necessary connection and returns the user data back as an array list to the controller. After getting the data we convert it to json format and return it back to the success function of our ajax call. Create an servlet named SearcController, use below code for reference. We want to connect to MySql database using jdbc. Create a file called Database.java and replace the url, username and password values with corresponding values of your database. Finally we need a data access object class called UserDAO.java which will interact with mysql database and return the data for autocomplete query made by ajax request. We have used sql like query here to fetch all the matching records for input characters. This is it. We have successfully integrated jQuery autocomplete with J2EE application. Like and share this tutorial if you find it useful, kindly use the comment box if you have any queries or suggestions. A web developer, blogger, amateur designer and an open source enthusiast.